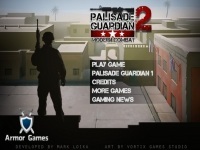 As one of many arcade games giving you the pleasure of shooting down invading enemies, Palisade Guardian 2 is a fanciful downloadable shooting computer game, and you could also play it online at no cost. It is a defense shooting game. The mission you have in this game is simple, and that is to protect your own barrack or base from large numbers of approaching enemies that are marching towards you. You are overlooking the battleground from the top of a building, from where you fight to resist your enemies and secure your base. Advancing towards you in vast numbers, you must guard your base by all means from the aggressive enemy troops. In the start of your campaign in Palisade Guardian 2, you are given just a rifle for free to combat the army but you receive credits for every enemy you kill, and object like tank that you destroy. Having accumulated these credits, you can buy sophisticated rifles, machine guns, hand grenade, and rocket launcher. You need massive firepower to sweep down on your enemies. Buy weapons with extra accuracy to annihilate your enemies. You need to be focused and open fire on at them because your enemies are approaching and attacking you in large numbers. Palisade Guardian 2 is such an interesting game that you get unlimited ammo to defeat the enemies coming to your base. The game gets more exciting as the enemy troops get beaten badly. They increase their power and intensity of attack by bringing in tanks, cannons, helicopters and machine guns to raze your building. You should try as much as possible to stay safe, calm, and defend. However, your best bet is to shoot them down as they are moving because waiting for them to pile up before attacking is futile. As typical of real life warfare, show no mercy to your foes. In order to have better chances of winning, identify which weapon works best against which enemy or object; and be fast to change these weapons as need arises. Palisade Guardian 2 is easy to play and its controls are easy to master. Use arrow keys to change your gun, while you press D or F to switch your weapon. Move your mouse to aim at your target, and fire or shoot at your target by left clicking your mouse. Press spacebar to zoom and R to reload the game. Shoot the zombies while playing music.